Do you want to start a blog? Are you overwhelmed and unsure of where to start? 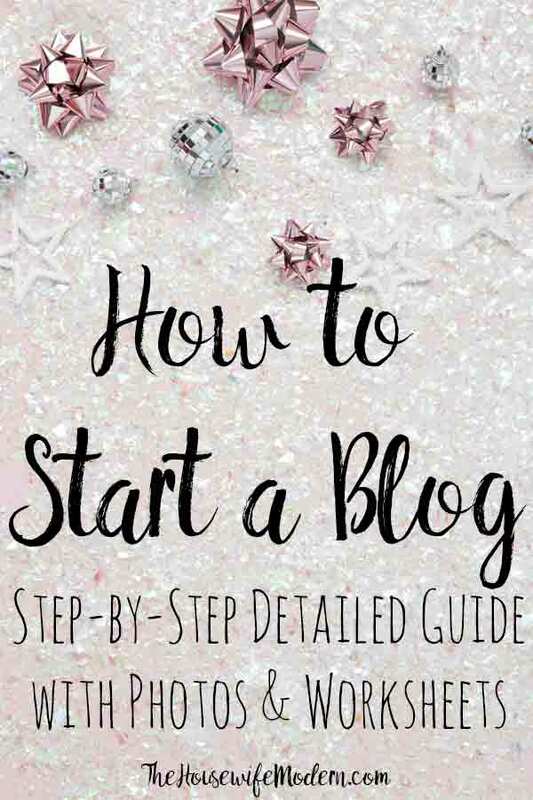 Then The Ultimate Guide on How to Start a Successful Blog is for you. 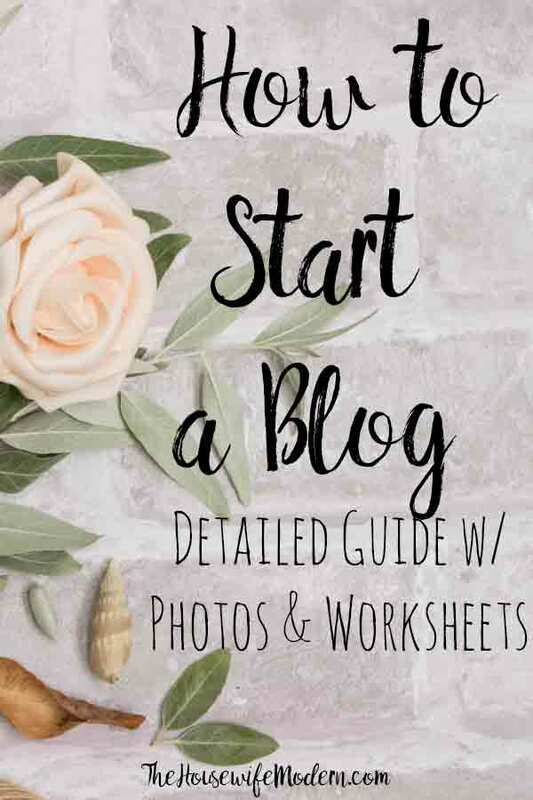 I have everything you need- including free printable worksheets- on how to start a blog. This is a LONG post. Actually…it’s a tiny book. Sorry about that. But unlike a lot of “build a blog” posts, I’m not just getting you to sign up for hosting, then dropping you. I’m going to go through EVERYTHING about actually setting up your blog and your entire website. Stick with me, invest a few hours, and get started blogging. As you go through this guide, if you have questions or something isn’t clear, please comment and let me know! I’ll fix the issue and get back to you personally. If you’re confused, someone else probably is too. 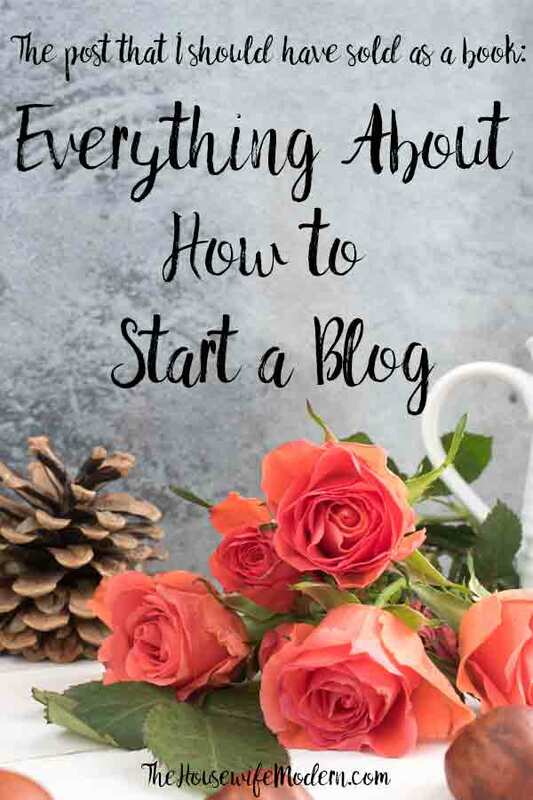 I want this to be a fabulous resource to help you start a blog. This is just the first part of a long series. After you get your blog set-up, we’re going to go into the work you need to do to start building success, whether you define that by traffic, income, or both. 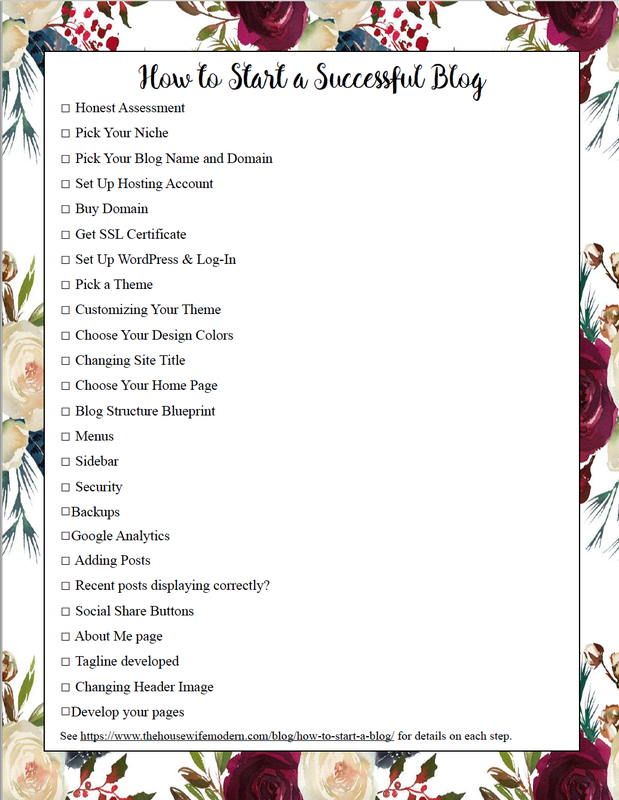 You can print off the Start a Successful Blog Checklist to keep track of where you’re at. • Recent posts displaying correctly? 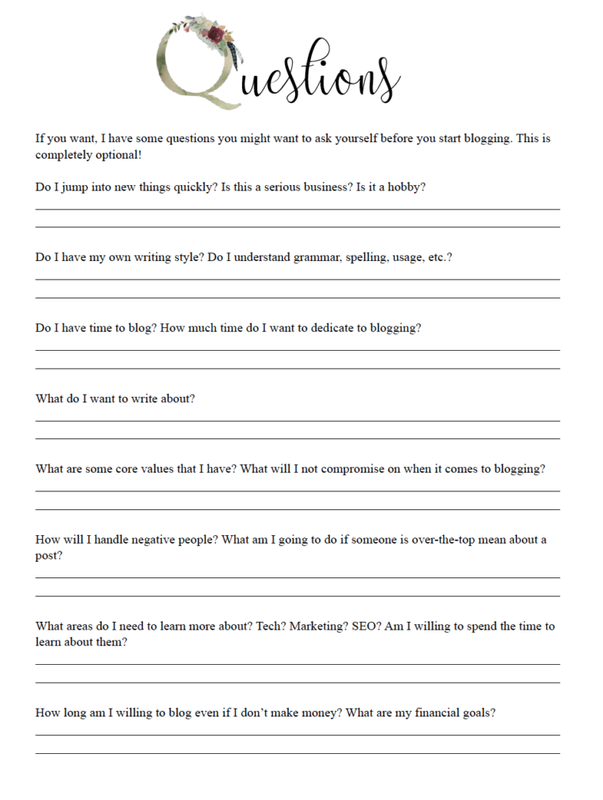 Start a Successful Blog Checklist <<< is available by clicking that link. Or you can click on the images. It will open up in a new window. You can then save the image to your computer and print. Before you do anything (especially spending money), do an honest assessment. Blogging is NOT get-rich quick scheme. I’ve read stories of bloggers who go from $0 to 6 figures in 6 months. But I’ve never met one. And I do a lot of networking. If you want to start a blog as a hobby, go ahead! I used to have a hobby website that I worked on for fun. Since hosting through BlueHost is only $3.95 a month (as of writing this), blogging is a cheap hobby. It takes time to make money. You have to build a following. You have to learn how to make money. Then you have to implement those strategies. It takes an investment to make money. Domain and hosting are the start. In the long run, you’ll want a good e-mail service. You may also need Lightroom, Photoshop, or keyword tools. Pinterest scheduling costs money. And if you’re going to buy resources (books or courses), that will cost money. Don’t get scared…you don’t have to buy all that right away. Just be aware that eventually, there are tools and resources you’re going to have to pay for. But if you’re passionate. If you LOVE what you’re planning on writing about. And are willing to work for it. Then blogging is for you. You’re ready to start an exciting adventure! All you need to start is $3.95 a month. Yep, that’s it. Or click on the images below, then print. How to pick a niche for your blog. I have experience with deciding a niche. Simply because I’ve bounced around in the blogging world before I settled down on this website. And this website wasn’t even my idea! I started with sarcastic commentary on current events. I made a little bit of money. It was fun. But I got tired of it. Then husband noticed my endless experiments- with food, with cleaners, with other stuff around the house- and suggested I start a housewife blog. I laughed at him. Seriously. Laughed. Started it as a joke. He even picked the name! And it took off. And I LOVE doing it. 3 years later and I’m still excited about new stuff for this site. So, do better than me. Sit down and think before you start a site. Pick a niche. 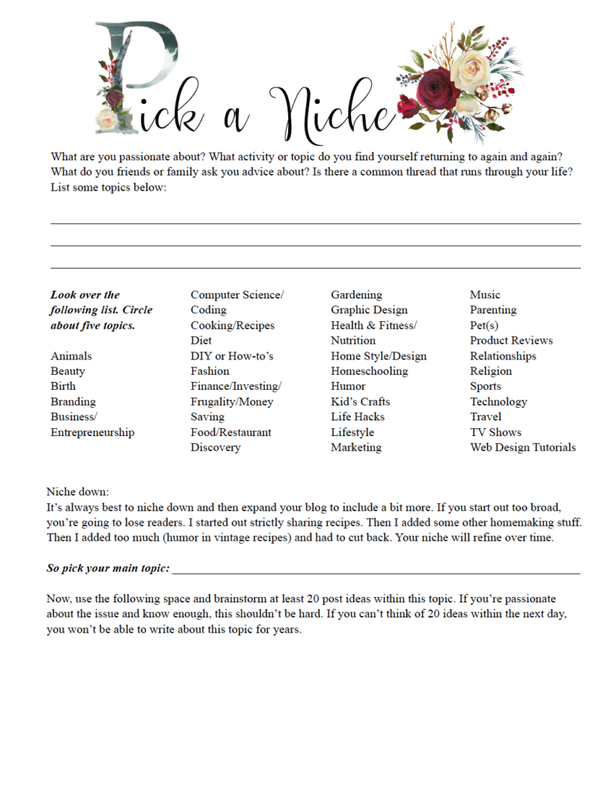 I included a worksheet to help you pick a niche. Put some thought into this. Remember, just because there are a 100 blogs out there already in the niche doesn’t mean you should avoid it. In fact, it means there is an audience for it! And none of them have YOUR voice, YOUR experience behind them. Don’t let the fear of competition keep you from your dream. Once you know your niche, here is where you start figuring out your blog name and domain (ideally, your blog name and domain will be the same). Make sure the name is easy to pronounce and spell. Keep it short.Include a descriptive word (such as perfect, pretty, wonderful). (SysteMagic has a ‘Positive Adjective Glossary‘ if you need ideas). Make sure there isn’t a blogger already using it. You might get into trademark issues in the future if you both want to claim the name. Avoid using symbols such as ! or &. Don’t misspell words, even if it’s cute. People won’t be able to find your blog because they’ll type in the correct spelling when they’re looking for it. Don’t waste weeks on this. Pick a name and go with it. Make it your own through your personality and passion. You can see whether a domain is available (and see what similar options pop-up) using NameMesh. Don’t buy your domain there. Just see what’s available. It gives you a bunch of suggestions, including “fun” options. You might see something you like. If you want to monetize, you want to go SELF-HOSTED. 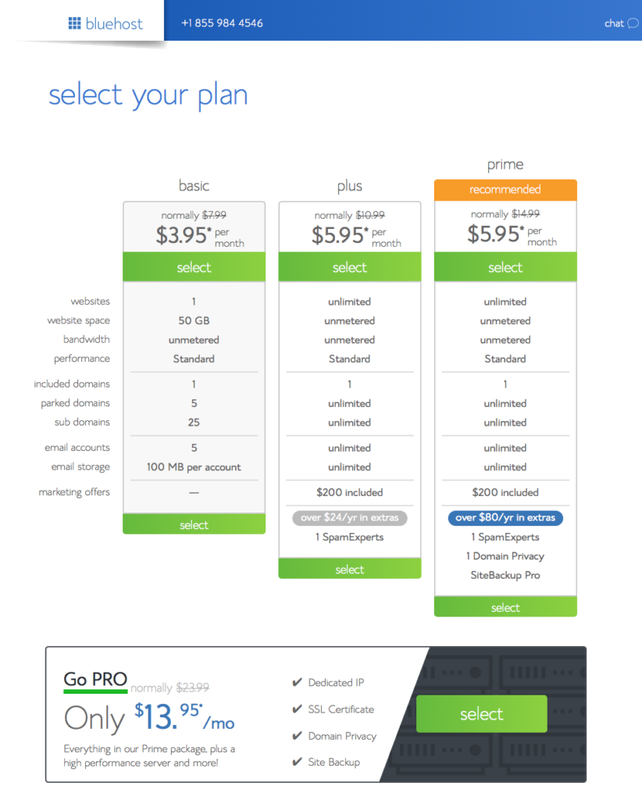 That means you pay someplace, such as Bluehost (below) to host the website. Then you install WordPress.ORG on the site and build the site using WordPress. WordPress.COM is a platform on which you both host and build the site. The problem with WordPress.com? 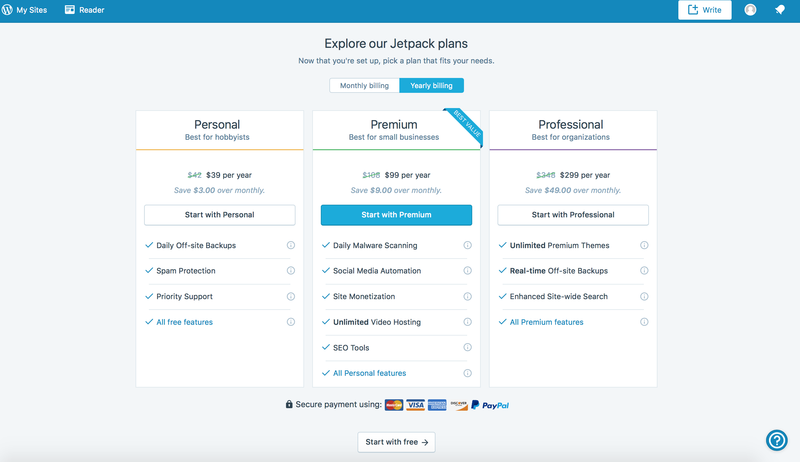 You have to pay for a premium or business plan to be allowed to monetize. And most brands won’t work with a site that’s not self-hosted. Hosting is a hot topic. At some point, you’re going to have trouble with your website. And you’ll have to deal with your host. If they don’t have good customer service, you’re going to want to tear out your hair. I, personally, use BlueHost. <<<that link right there will take you to where you can sign up! That link takes you to the current special they’re offering my readers. I’ve used them for the first three years of my blog and was very very happy. In the interest of disclosure, once you get to a certain point (traffic-wise), you’ll want to switch hosts. I’ve heard bad stories (about the customer service) from other people about BlueHost, but I haven’t had these problems. I did have a problem getting my SSL certificate set up…but that was the tech I was talking to. When I got on the next day and chatted with a different tech, they sorted out the issue immediately. The couple of other times I’ve had to contact them (I set up two other sites through them over the years, so I’ve been in contact with them when there wasn’t problems), they’ve been very helpful and understanding with my complete lack of tech knowledge! My website has NEVER mysteriously gone missing (I’ve heard that about other hosting companies). As I said, my one and only problem was with SSL…and that was one tech. The next person helped me completely and even got all the re-directs set up (and I had hundreds at that point). Tough love: if you want a SERIOUS blog, do not use Blogspot or WordPress.com. They might be free, but you need a self-hosted site for a long-term successful blog. And Google doesn’t rank blogs well from the free sites. Aka- you’re not going to be able to get in the top of the search results. And SEO traffic will be an important source of traffic for you in the future. Since I recommend Bluehost, the images below are for setting up your hosting with them. It includes exactly what to do! Once you click on "BlueHost" in the link above, it will offer you different hosting plans. Choose the one that works for you. After you’ve picked your hosting plan, it will ask you whether you’re registering a new domain or if you already have a domain name. I’m going to assume you’re reading this and you want to start a new site. So type in the “New domain” box what you want your website url to be. Just the name…not the http or .com part. For example, I would type “thehousewifemodern” for this site. 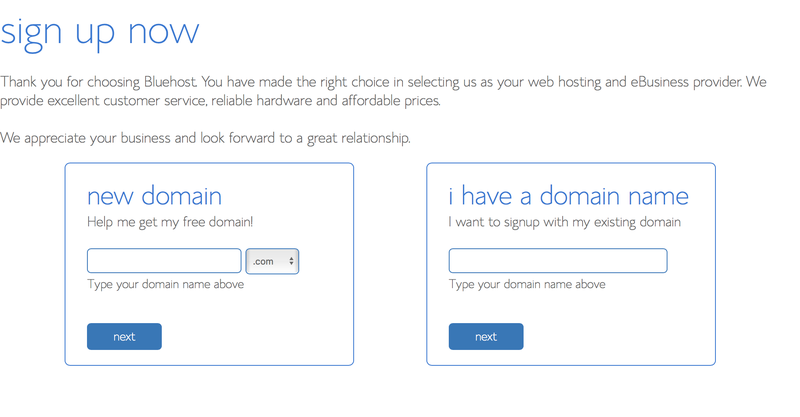 If you want a new domain, type what you want into the "new domain" box. Having an SSL used to be optional. Well, it’s still technically optional…but almost every browser will display a warning to users that your site isn’t secure. And then they’ll close out without actually visiting your site. So, buy an SSL certificate. Trust me. I started my site before they were “mandatory”. Adding one later involved re-directing a bunch of url’s and I lost all my follower counts. *Update August 2018– Bluehost now automatically gives you a free SSL certificate when you sign-up. During the sign-up process, you should see a box checked that says “SSL.” Just leave that box checked! It will then ask you for all your personal information. Do NOT get the Sitelock Security stuff. (You might have to uncheck the box). First, know that WordPress.com and WordPress.org are two different things. WordPress explains in this post “WordPress.com and WordPress.org“. You are going to be working on the .org. That being said…you’ll probably have to set up a .com account because some plug-ins require you to log into one. But don’t worry about that now. 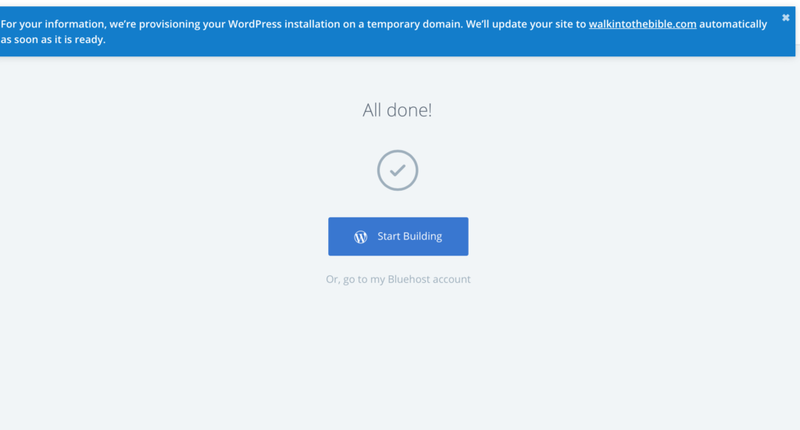 ***Update Aug 2018- Bluehost now automatically sets up WordPress for you! Side note: Bookmark your Bluehost page. When you get to the WordPress admin page, bookmark that too. I suggest starting a folder for blogging bookmarks. They’re going to add up! Haha. After you hit the purchase button, this screen (or one like it) will pop up. 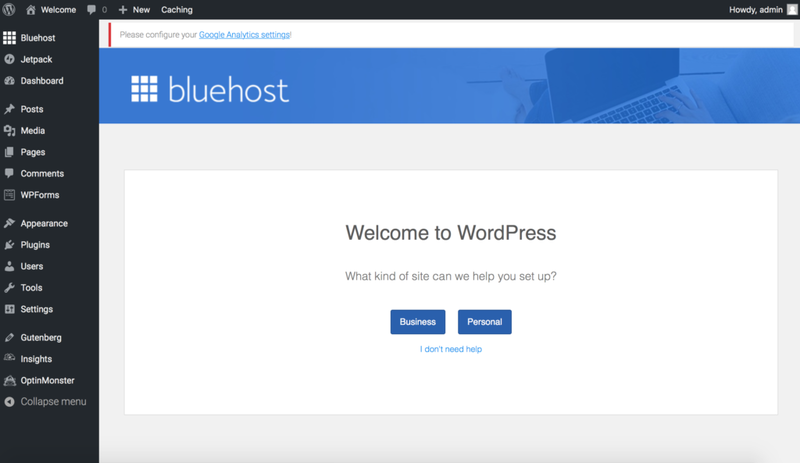 Bluehost is setting up Wordpress for you automatically. It WILL take a few minutes. Just be patient. Note that when I set up my latest site, since the WordPress set-up was automatic, I didn’t get notification of my admin page and log-in. Once it was set-up, on the Bluehost panel, I clicked on “Start Building” (in image below). It auto-logged me in. It was necessary to contact chat support for them to send me a password re-set link. Your sign-in username will be admin. After the set-up is done, this screen will pop up. Click on "Start Building" to visit your new Wordpress dashboard! WordPress has a learning curve. You are going to get frustrated. This is normal. (If you’re feeling really overwhelmed, I recommend Grayson Bell’s FREE course, Understanding WordPress.). 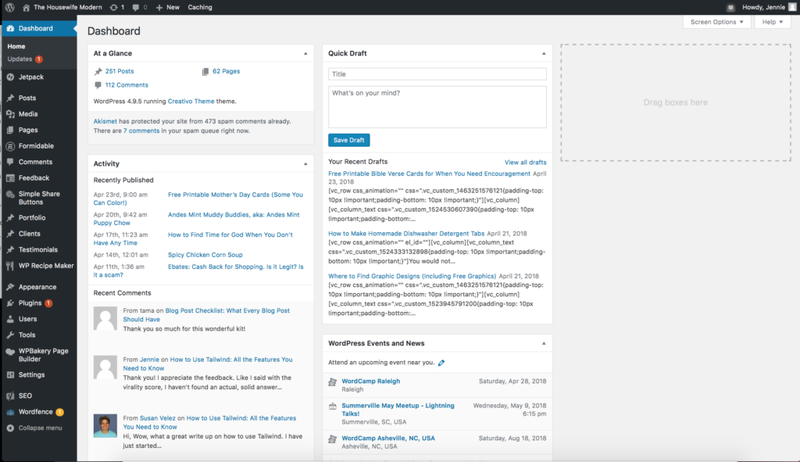 When you first log into WordPress, you will probably see a screen like the one below. I choose “business.” I’m going to assume you are also. If you’re building on WordPress, long-term you’re probably thinking of making a profit. So start thinking like a business today. A screen like this will probably be what you first see. Select "Business." (unless you are running your blog strictly for personal updates). There is another section below called “Choose Your Home Page”. 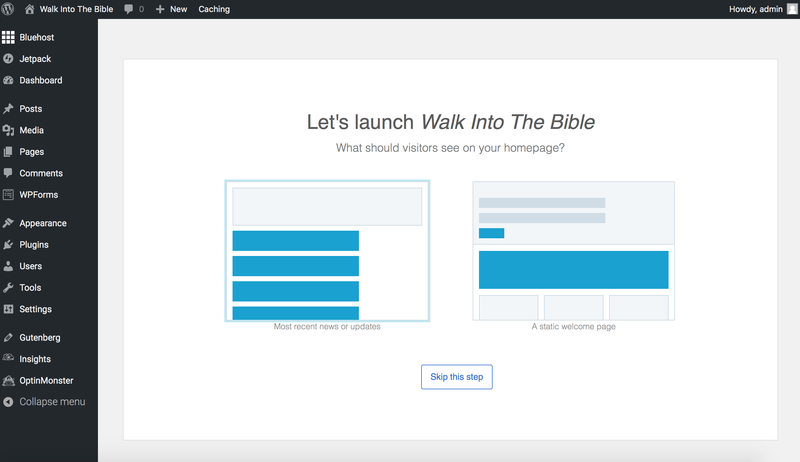 WordPress now (they changed it recently) prompts you to choose your homepage at this point. You need to decide what you want your home page to be: a static page that you control the content of -or- the traditional “blog” page that shows posts in reverse chronological order. A static home page allows you to put your very best content on display. It also allows you to pitch recent products, share news, or anything else you want! Static home pages are almost universal these days, but you’re not required to use one. For the sake of ease, though, I’m going to assume you want a static home page that you create. So select “a static welcome page”. Suggestion: A static home page allows you to showcase your best content and change what you show readers. Choose that option. Wordpress is then (if they don’t change it) going to ask you if you want to set up a “starter contact us page”. Select “no.” We’re going to go into a contact page (and about me) page in depth later. WordPress may ask if you want to connect to Jetpack. Do you want my honest opinion? I’m used to using Google Analytics (you’re going to install this anyway because the stats are MUCH better). Plus, I suggest a more robust security (I use Wordfence). So I’m on the fence about whether to recommend you install Jetpack since I don’t use it myself. 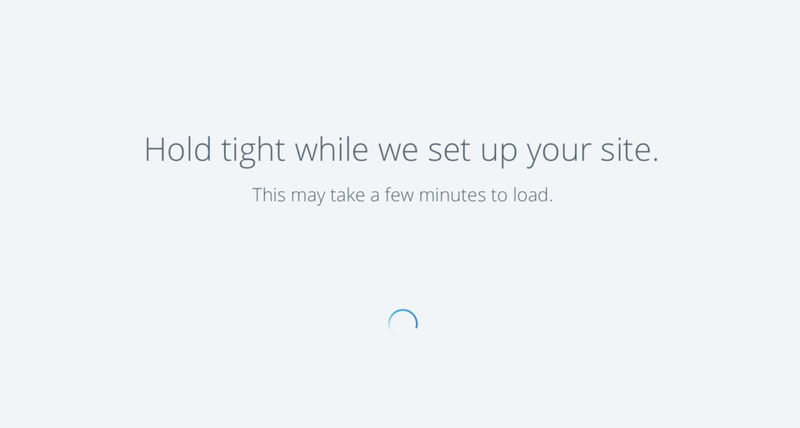 IF you want to….go ahead and and “connect to WordPress.com”. It will direct you to payment options. Scroll down and you’ll see a little button “start with free.” Choose that! 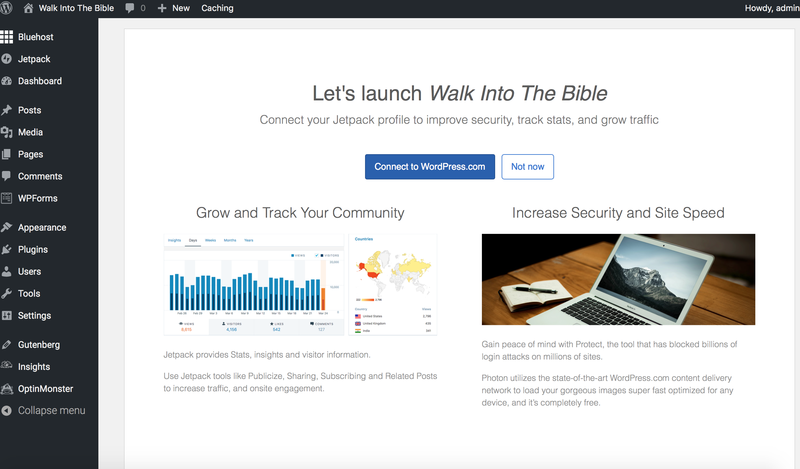 IF you want to set up Jetpack, go ahead and click on "Connect to Wordpress.com". Choose the free option (small button below those big areas asking for money...haha). Don't invest money in your site unless you know exactly what you're getting and why. IF you decide to go ahead and connect Jetpack, it will tell you to activate features. I suggest NOT doing this. There are a lot of options and you don’t want to just start bogging down your website with stuff you might not need. So just click the little ‘x’ in the upper right hand corner. WordPress should now drop you onto your dashboard! You’ll probably have notifications at the top trying to get you to signup for e-mail service, opt-in forms, other stuff (it changes). Just close them. I think I’ve mentioned it…but you’re going to invest money in your website. But when you do so, make sure you know exactly what you’re buying and why. Below is a screenshot of what my dashboard looks like. Yours will look much the same. You (obviously) won’t have the recent posts I have, etc. Plus I have a few options on the toolbar on the left that you won’t have. But this is your dashboard. Welcome to WordPress! This should look similar to your Wordpress dashboard. Say "Hello"...you'll be spending a lot of time on Wordpress. Picking a theme is one of the most important choices you’ll make. With that in mind, I did an entire post for you: “How to Choose a WordPress Theme: What You Need to Know.” Check it out and them come back here! To change your theme, go to “Appearance” on the sidebar, then click on “Themes”. WordPress will probably have a few standard ones installed. Click on ‘Add new’ on to the top to view more. A ton will pop up…you have the option of previewing them without actually installing them. Pick your theme. Click on “install” (it is next to preview). This installs the theme on your website. Mojo Marketplace– has thousands of themes. I personally use the Creativo Theme by Rocky Themes. It’s a wonderful theme…but it has too many options that I don’t need. If I ever get around to a redesign, I’m going to go with a lighter theme. The theme itself is beautiful, easy to customize, etc. In fact, I’ve put off a redesign for over a year because I love it so much. Elegant Themes– if you want a stand-alone theme (that doesn’t require Genesis framework), than Elegant Themes is a good place to start. One of their themes is Divi, the “most popular premium WordPress theme in the world.” Just keep in mind that if you go with a stand-alone theme, it will be harder to change in the future. Whereas if you go with Genesis framework and a child theme, you can change the child theme with minimal hassle. Restored 316– this is another place I highly recommend. I have a ton of blogger friends who use their themes and love them. Pretty Darn Cute– this is the final place I recommend. I have a few friends (this is a smaller company) who have gone with them and have been very happy. 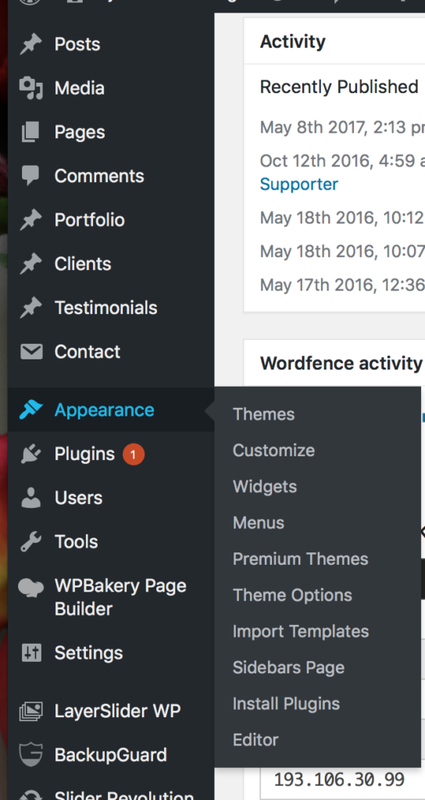 To install a theme, go to "Appearance," then click on "Themes." I put this up here even though we’re not customizing stuff yet because I want you to go to your theme options and look through it. See what the options are. Familiarize yourself with what the options are. While I give the best directions I can below as we develop our site, different themes have you change things (such as header image and favicon) in different places. A lot of the things we’ll go through before will require you to customize your theme. So go there now and get a general idea of what you customize here. To customize your theme, hover over "Appearance," then click on "Theme Options". Your screen will look very different depending upon your specific theme. I wish I had done this before I started customizing everything. So I’m going to get you started off on the right foot. Pick your design colors- your color palette. You’re going to use these main colors consistently throughout your website. It will give it a professional feel and helps with your branding. In addition, by choosing now, as we go through and set up your home page and menu, etc. …every time you have to choose a color, you’ve already decided! Not only do I use the same exact shade of purple all over my website, I use it in my pin images. Branding! So, how do you pick your design colors? I read through it when I was picking my design colors and found it so helpful. 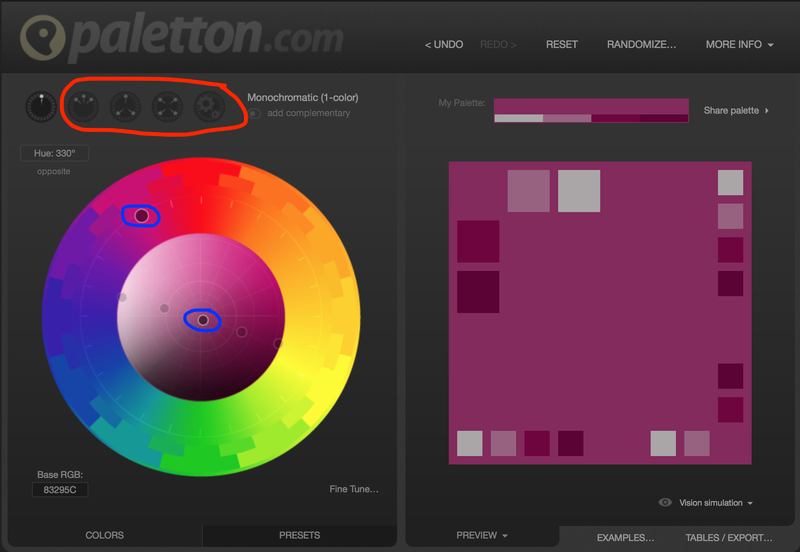 Here is the other tool you’re going to want: The Paletton Color Scheme Designer. Click on the scheme designer link above. Now, look at the image below. • Circled in red is where you choose if you want adjacent colors (colors near each other on the color wheel) [this is what I did], a triad, or a tetrad of colors (Google uses a tetrad). • Circled in blue is how you are going to change your primary color. Play around and pick a primary color. You’ll see the colors in the box on the right changing as you adjust your primary color. Once you find a primary color you love, try out the adjacent, triad, and tetrad views. You can adjust the secondary dot for how “far” or “close” to the primary the secondary is. Play around with the dots. Is there a colors scheme that appeals to you? If so, write it down. The best way to note this, is copy the exact “Base RGB” (it’s in the little box to the lower left of the wheel) and note if you’re adjacent, triad, or tetrad. All you have to do later is paste the code in and pick the appropriate option and your colors will pop back up. I suggest taking a screenshot of your color scheme. Then picking at least one more color scheme. Then bounce the colors off of someone else. I asked for feedback from my friends on Facebook. When asking for feedback, I posted screenshots of three different color schemes. Surprisingly, they felt that the purple scheme I liked (which is darker and not as bright as most food blogs) fit my personality better than the bright pink, blue, and green schemes I “should” have gone with. And the purple has worked well. Once you have your color scheme picked, click on “Tables/Export” (it’s underneath the square shape that shows your color palette) to save your colors in various formats. There are multiple export options. With some themes (especially basic free starter themes), you can change the words shown in the header section. 1) Go to “Appearance” on the sidebar. Then click on “Customize”. 3) Type in your site title (aka- blog name) and tagline (just pick a quick tagline…we’ll spend more time developing a tagline later). Save. You can also change your favicon while you are in here. (Some themes have you change the favicon under ‘Appearance>Theme Options’). In addition, go to ‘Settings>General’ and put your site title and tagline in here also. Click on "Site Identity" to change your site title and tagline that are displayed. Go to “Pages” and click on “All Pages.” Towards the top of the page, click on “Add New.” Name your new page (mine is literally named “Home”). Design your page however you want. ~Mine has: 1) my opt-in at the very top, 2) four of my most popular recipes, 3) a recent posts section, 4) seasonal content, and 5) popular printables. 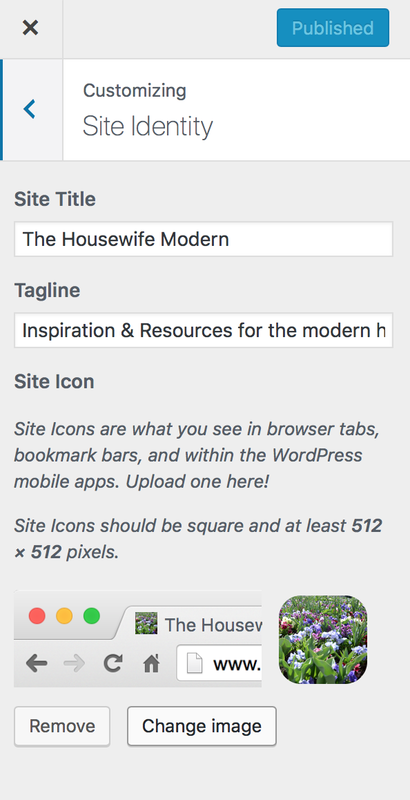 Visit “The Housewife Modern” to see my static home page. Since you’re just starting out, you might be wondering what to put on this page. I suggest setting aside a spot for recent posts and a spot for popular posts (or posts you want to drive traffic to). For now, just put text in that area saying something such as “Coming Soon.” Your static home page will be constantly evolving. I change mine every month with new opt-ins and seasonal content. 2) Click on “Homepage Settings”. 3) Select the “A static page” option. Then, under ‘homepage’, use the dropdown box to select your home page. Go to "Appearance" on the sidebar. Then click on "Customize". Select the "A static page" option. Then, under 'homepage', use the dropdown box to select your home page. Yes, I promise we’ll get around to writing posts soon. But trust me, life goes best if you organize first, then jump into publishing content. You already know your niche and have an idea what you want to write about. But now we’re going to sit down and fill out an actual blueprint of what you want your blog content to be. This is going to do a few things. 1) As you write post, you’ll be prompted to ‘categorize’ them. (We’ll set up categories later). By having a blueprint, you’ll know what category your posts will fit in. 2) This blueprint is going to help determine what how your menu is set up, what pages you have, and more! 3) If you every get writer’s block in the future (it happens to the best of us), just go back to your blueprint. Check your pages. Is there a page that could use more content? Brainstorm on something for that particular area. Blog Structure Blueprint <<< is available by clicking that link. Or you can click on the images on the right. It will open up in a new window. You can then save the images to your computer and print. 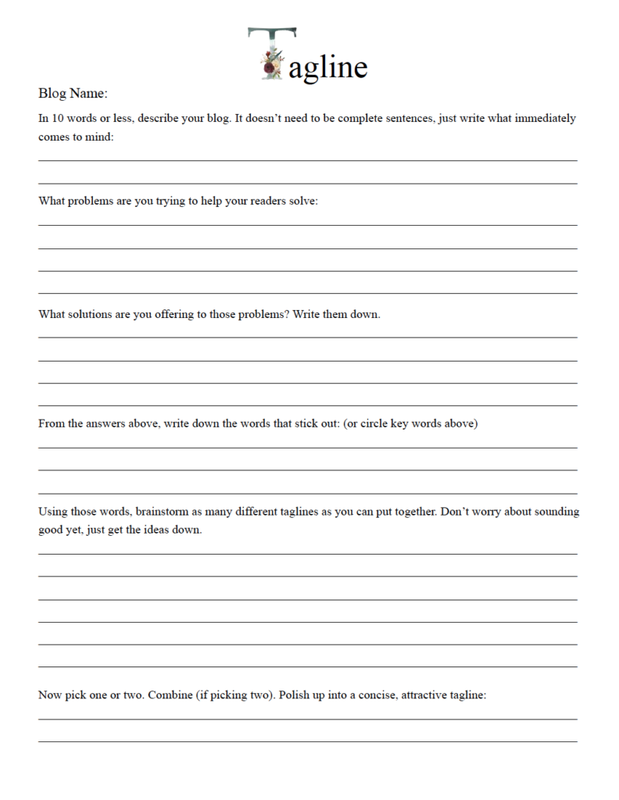 This is a two page worksheet that walks you through brainstorming some ideas related to your niche. Keep in mind this isn’t carved in stone! You can change your categories or adjust your focus in the future (and probably will). Right now, we want to just build a wooden frame for organizing your house. As you work in the future actually writing posts and refining your message is when you’ll actually be laying brick. 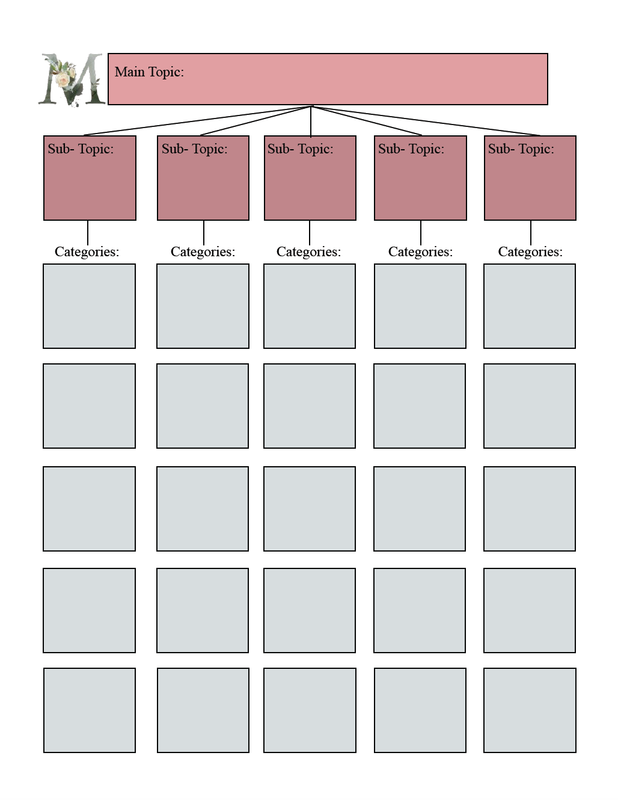 ***Update: I had some questions on the Blog Structure Blueprint. Here is an example from my website. My main topic is: homemaking. My sub-topics are: recipes, holidays, printables, inspiration, and “all the rest”. My categories for recipes are: appetizers, main dishes, desserts, etc. My blog posts would are categorized based on these “categories” you’re going to set up. For example, my “Red Velvet White Chocolate Cheesecake” shows up on the “Desserts” page/category. I included an image below this that shows the top and main/primary image with them circled and labeled just to make sure that this is clear. First, you need to set up your menu content (aka: what displays on the menu). 2. At the top (circled in blue in the image below), select a menu to edit -or- you can create a new one. 3. Using the bar on the left (circled in red in the image below), select pages you want to add to the menu. You can also select specific posts or other items. 4. As you add the items to the menu, they will popular under “Menu Structure”. To re-arrange, just grab one of the items (such as “home,” circled in purple in the image below) and drag it up or down. 5. Click “Save menu” to save any changes you make. Simply repeat the above steps to change any other menus. Now, you shouldn’t have trouble deciding what to put on your menu! Go back to your “Blog Structure Blueprint.” Your sub-topics will likely be the main pages on your website. Since you’re just beginning, though, you probably won’t have pages set up for all your sub-topics. That’s fine. Just add your home page to the main/primary menu. And keep in mind that this is where you’ll be adding your other major pages. Also, you might not even have a top or footer menu yet. That’s completely okay! I didn’t even put a top menu on my website until about 6 months ago. I started the “Blogging Resources” section of the website. Since it’s not my major content and didn’t fit in with the main menu items, I decided to make a top menu. I also decided to put “contact me” and “about me” up there so as to not clutter my main menu. You have your menu(s) set up. 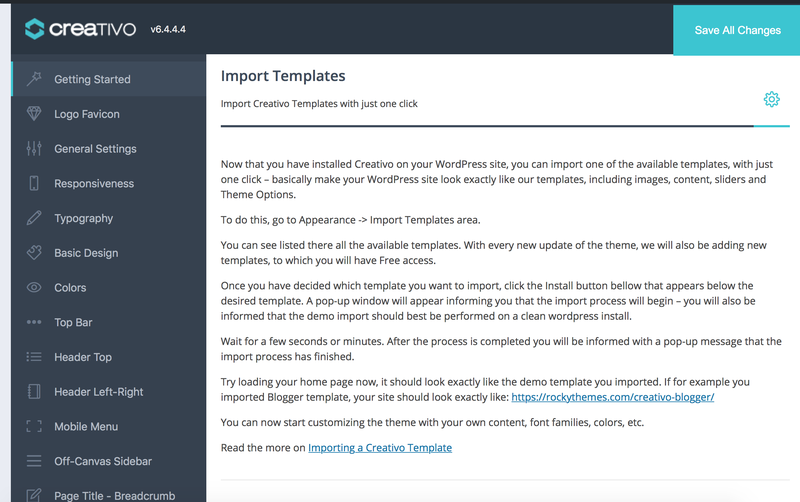 Now you need to tell WordPress where you want them to display. For most themes (yes, some will be different, I’m sorry), you will go to “Appearance>Customize”. 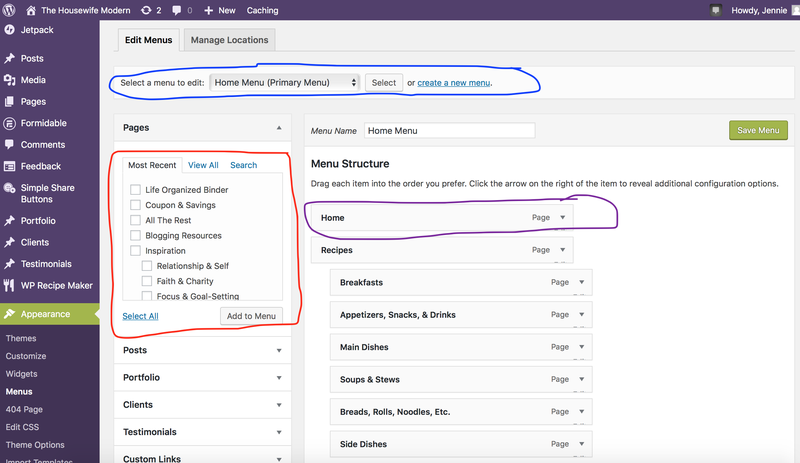 Then select “Menus.” Under “Home Menu,” select the main/primary menu (the one that included your home page) that we just set up. If you also set up a top menu and/or footer menu, this is also where you tell WordPress which to display where. Make sure to save any changes before you exit. How to set up a sidebar in WordPress. Another thing that many websites have is a sidebar. And WordPress made this confusing! If you look for a sidebar option on the side, you won’t find one. It’s a trick! Go to “Appearance>Widgets.” Yes, widgets. There is logic. You re-arrange widgets to decide what goes on your sidebar. This is one area you’ll have to play with a little bit. 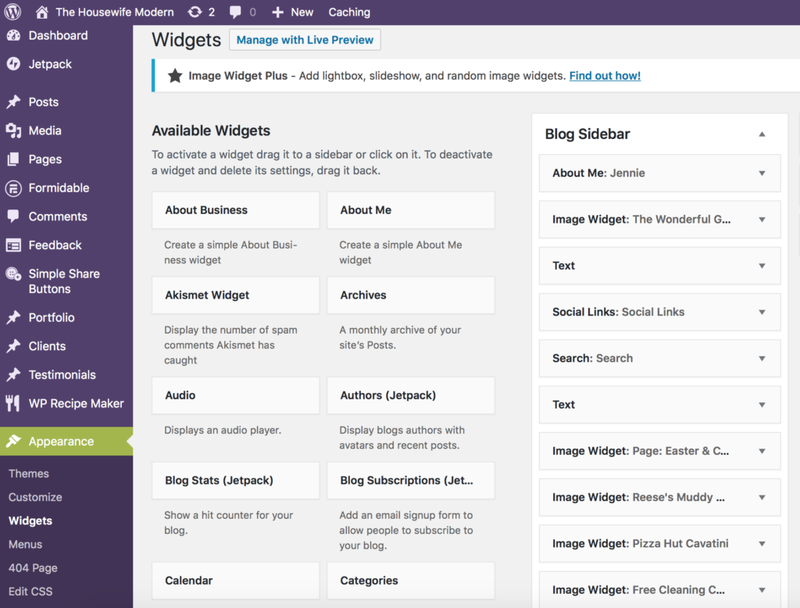 WordPress populates some widgets automatically. And each widget is slightly different. Your theme also might populate additional widgets. And you can add plug-ins that give you widgets with more control/extra options. Yes, it’s confusing. • Adding the “about me” widget standard with WordPress. It allows you to add an image and a brief blurb about yourself. People like to see who is talking to them. When we set up your about page later, we’ll come back and edit your widget to direct them to the about page for more information. • Social links. So people can follow you on various social media pages. If you don’t have those set up yet, don’t worry. You can always come back and add this widget later. Remember, this is YOUR website. If you don’t want one of those, don’t worry about it. As you develop your blog, your sidebar will ideally include an opt-in to your e-mail newsletter, some ads (for income), and your top-performing posts. With almost all themes, the default page layout should display the sidebar (assuming there is a widget in the sidebar to display). In fact, it’s HARD to force a full-page layout without a sidebar. So I’m not going to go through the steps to get a sidebar to display. If you’re using a custom theme that isn’t displaying your sidebar, please see your theme details/trouble-shooting. Go to "Appearance>Widgets" to change what displays in the sidebar. I know. You’re thinking “who in the world is going to hack ME?! I’m tiny, I just started.” I thought the same thing. And learned better. And had to clean up the mess. Get security now. I suggest Wordfence. They have a free version. At least get that now if you don’t want to pay for premium. I pay for the premium because after getting hacked once I know how important security is. 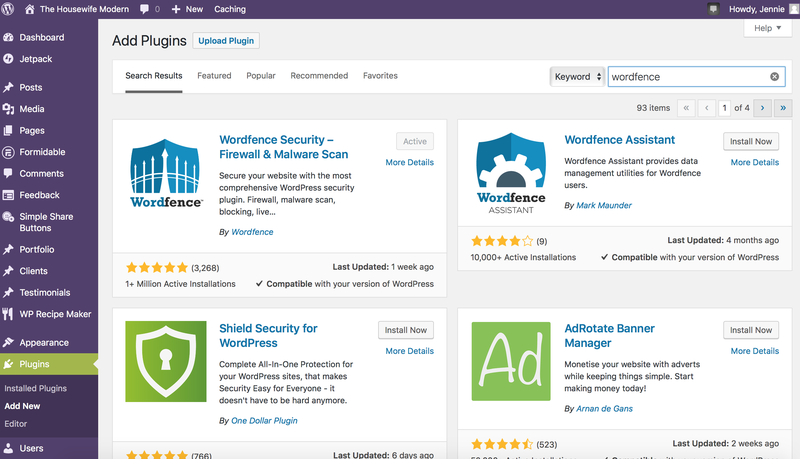 You don’t have to get Wordfence. I’m indifferent. But please get something! In case your site does get hacked or something else happens (computer problems happen), you want backups. Regular backups. Get a backup service now. I use Vaultpress, but that costs money. It’s up to you. Some hosting plans include back-ups. If yours does, make sure you know how long they keep the backups. And how you can restore it. The last thing you want is to assume that your hosting plan is making back-ups that you can restore to only find out they aren’t. You’ve already put a lot of work into your website. And you’ll do more. So make sure all that work is saved somewhere. That you can access. Set up Google Analytics. ***Google is constantly changing how things are done, but I’ll update this later with basic instructions on how to do this. This post is constantly evolving, so bear with me! Whew! While there are a few more things you want on your website, I think we should go ahead and get a post (or multiple posts) written. Pull out your “Pick a Niche” worksheet from earlier. There should be plenty of post ideas at the bottom. Go to “Posts>All Posts”. Then click on “Add New” at the top. I have a “Blog Post Checklist” that shows you everything that a great blog post has. Don’t worry if you don’t include everything in your first few posts. Right now I want you to worry about getting some posts written. The checklist is more for later when you’re refining your quality and content. I’m going to be straight-up honest. When I picked my theme, I was very careful to pick a drag-and-drop theme. While I can write html, it’s not my strong-suit. And I wanted to write great content. Not learn HTML. So I can’t walk you through writing a post using all the little features of WordPress. Plus, my job wouldn’t be as good as the job done by “WordPress Beginning.” Check out their post “How to Add a New Post in WordPress and Utilize All the Features.” It will walk you through the various features that WordPress offers. You won’t use them all…but this is a great walk-through for you. Bonus: building a page is almost exactly like writing a post in WordPress (unless you’re using a drag-and-drop theme). So you’ll learn a lot that you need to know. When you write your post, make sure you categorize it! Remember, we already decided your categories using the “Blog Structure Blueprint.” Remember, your website will evolved. It’s completely okay to cut or add categories if you decide they’re not a good fit for you or your audience. I suggest going and writing at least one blog post. Then come back here…we have more to do if you want a fabulous website! We discussed having a static home page with recent posts displaying. You might also have recent posts being displayed in your sidebar. Now that you have a post (or more than one) published, go back and check that they are displaying. The sidebar is easy…you just use a widget. For your static home page, this will depend on your theme. I use a drag-and-drop theme where I just drag “recent posts” to the page and drop it. Then I select any options I want. And the posts display. However, if you’re using a basic theme, you might have to code for it. Again, I’m going to send you to WordPress Beginner. Check out “How to Display Recent Posts in WordPress” if you’re having trouble. Great! You have at least one post up by now. But we want to make it easy for people to share your content. You’re going to use this using social sharing buttons. I have a screenshot of one of my pages and what my buttons look like below. I used to use a plug-in called “Simple Share Buttons.” They’re not longer supported. Myself and the bloggers in my mastermind group all use “Social Pug” now. Another popular one is Social Warfare. I hate Social Warfare. You might have seen them on sites…they’re the ones that display vertically along the side of the post and scroll with you. On my computer, they cut off the first 1/2″ of content so I have trouble reading it. On every site that uses them. This doesn’t happen on all computers or devices, but it does on some. And over the last 3 months they’ve broken a few sites with bad updates. Though they’re popular, they’re not on my personal recommended list. Other options are “Shareaholic” or “Add This” buttons. But as I said, I recommend Social Pug. To add, go to “Plug-ins>Add New.” Then do a search for whichever one you want to use. Install and activate. With most plug-ins, you can customize how they display. Once you activate the plug-in, it will appear on your WordPress dashboard sidebar on the left. Mine shows below “Comments” and above “Appearance”, but yours might be different. This is where you click to make any changes to the plug-in- such as which buttons you want to display, how the buttons look, etc. With Social Pug, you have to go in and activate where you want them to show. They will NOT automatically display until you tell them where you want them to show up. I use "Simple Share Buttons" for my website. I've chosen the platforms to share on as well as customized the buttons. I hate writing “about me” pages. I doesn’t matter what I do, I just feel my personality comes across. That being said…you still need one. To start with, I would combine your “About Me” and “Contact Me” page. Once you have your site more developed, and have a need for separate pages, you can split them. 1) Go to “Pages>Add New”. Add whatever content you want. If you’re not sure what to write on this page, check out Melyssa Griffin’s post “How to Write a Killer About Me Page“…it includes a free worksheet for you! That’s one reason there isn’t a worksheet for this section…she’s an expert. 4) Go to “Appearance>Menus” and add your “About Me” page to whatever menu you want it to appear on. If you’re just starting, it will probably be on your main/primary (only) menu. Make sure you save your menu before you exit. 5) Double-check that your sidebar and menu are both displaying the page and when you click that it goes to the correct page. You might be wondering why tagline is all the way down here instead of up with developing a blog name. There is logic. I wanted you to work through your Blog Structure Blueprint first. This gave you a basic feel for your audience and topics you would cover. I wanted you to write a blog post first so you could make sure you could churn out content. And I was hoping you would work through the worksheet in the “About Me” section above. That would give you even more insight into your readers and what you’re providing. By now- if you’ve been working hard on each step and not rushing through this- you should have a good idea of your audience, niche, what you’re writing about, and what you’re providing. Now, we’re going to develop a tagline. Below is a worksheet to help you develop your tagline. 3) Type in your new tagline. Save. 4) In addition, go to ‘Settings>General’ and put your site title and tagline in here also. 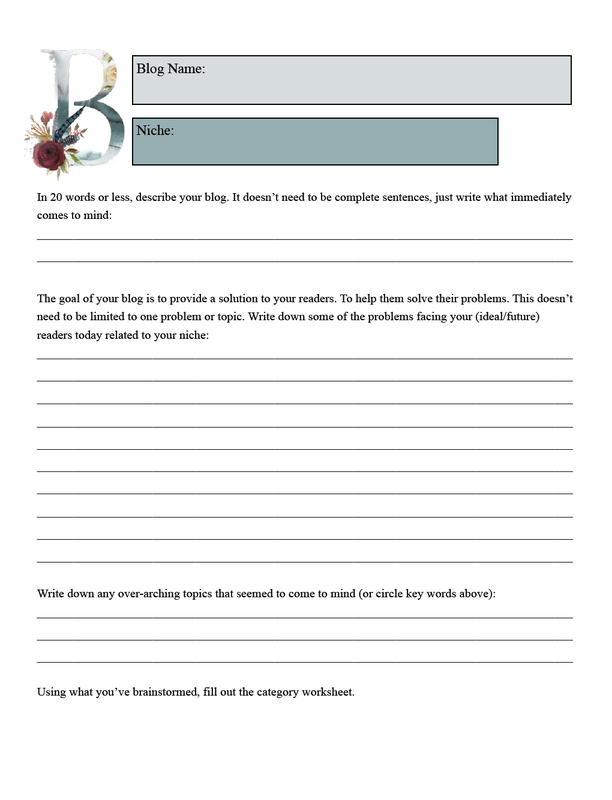 Blog Tagline Worksheet <<< is available by clicking that link. Or you can click on the images on the left. It will open up in a new window. You can then save the images to your computer and print. A. If you feel comfortable, I suggest developing your own header image that includes your blog title and tagline. If you scroll up, you can see that my “site title and tagline” we edited earlier don’t even appear. What you’re looking at is actually my header image that I developed. Most of the more professional themes will be the same way. Even if you have something typed in the site title and tagline, it might not be displaying (or if it is, there is an option to turn it off). 2. Then tell your theme to display this as your header image. Depending on your theme, you will do this different ways. I included screenshots of both below. As well as describing them below. B. You can use any image that you feel fits. In this case, find your image. Go ahead and upload it into media. Then follow the description below. ~~~To tell WordPress what image to display for your header image, it will depend on your theme. There will be two basic ways. 1. Go to “Appearance>Customize.” If your theme doesn’t have it’s own custom way to do this, you will see “Header Image” as an option. I included an image of the “Customize” screen below. I put a red line where “Header Image” would appear if my theme didn’t offer a custom way to do this. Once you click on “Header Image,” there will be a button to click to “Add New Image.” Then select your photo. Save changes. 2. If your theme offers a custom method, you’re going to go to “Appearance>Theme Options.” I included a screenshot of my theme options, but remember…yours will probably look very different. In your specific theme, find where it has you adjust the header image. Mine is labeled “Logo” and there is a button labeled “Upload” which allows me to select which image to use. If your theme does not do custom method, Go to "Appearance>Customize." You will see "Header Image" as an option. I put a red line where "Header Image" would appear if my theme didn't offer a custom way to do this. Once you click on "Header Image," there will be a button to click to "Add New Image." Then select your photo. Save changes. If your theme offers a custom method, you're going to go to "Appearance>Theme Options." Your theme customize page will probably look very different. Find where it has you adjust the header image. 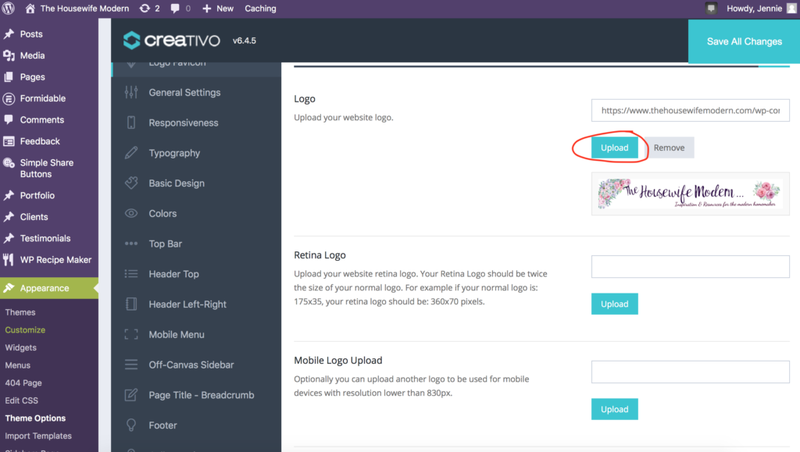 Then select ‘upload,’ ‘choose,’ or whatever option they provide to set your header image. Before you further…I want you to have at least five blog posts written. This will give us some content to put on any pages we’re setting up. You already did the Blog Structure Blueprint. As stated, the sub-topics will probably be your main pages. 1. You create new pages by going to “Pages>Add New”. Or you can click on “Pages>All Pages”. There will also be an “Add New” button on the top. 2. If you’re not using a drag-and-drop theme, I mentioned that WP Beginning has a great guide “How to Add a New Post“. While we’re building a page, it is much like building a post. The features will be identical in editing. 3. Go ahead and pick a page to build. You can glance through mine to get some ideas. For example, my food pages are simply a display of all the posts in that particular category (such as main dishes). While my printables pages actually include all the images and files for the printables on those pages. Different pages will have different needs. You have the best idea of what your website should be. 5. Go to “Appearance>Menus” to add your page to whichever menu you want it to display on. Save menu. 6. Go to your website. Refresh it. Congrats, your new page should be displaying on your menu. Click on it. Your new page should appear! Simply repeat these steps for all other pages you want. Whew! If you made it through that post, congrats. I’m impressed. I hope something was helpful. You have your blog started. Your website has to be amazing by now. Seriously…we hit everything you should have. But now that you have a website, I bet you’re wondering where the money comes from. Yes, I’m going to tell you. Thank you so much for this. 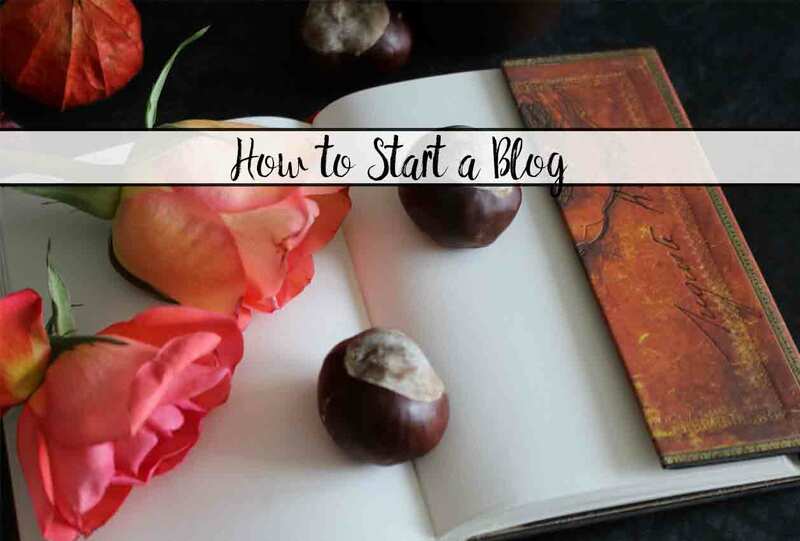 This is one of the most helpful posts on starting a blog I have seen on the internet. I am so not tech savvy and I was able to work out a lot of things with the help of this post! Seriously, thank you!! I will definitely be sharing it with fellow blog newbies. 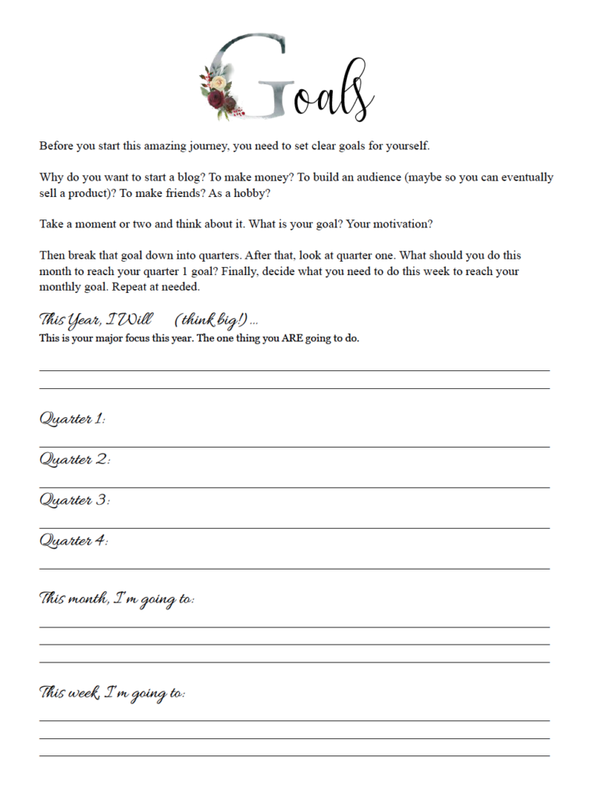 Quick question on the blog content worksheet- I’m confused on the difference of the sub. topics and the categories. Can you explain these a bit? Are categories like blog posts and the sub. topics are the overhead of those posts under the main topic umbrella? Is that right? Seriously, thanks again! This has been so very helpful! I should have been clearer. I’ll go back and edit the post to give an example. I’ll give an example from my website. My main topic is: homemaking. My sub-topics are: Recipes, Printables, Holidays, Inspiration, and All the Rest. Then UNDER each of those various categories are the actual blog posts that fit into that category. Does that make a little more sense?